This Program partners with low to moderate income homeowners who have sustained damage to their home due to Hurricane Florence. Through this repair program, Cape Fear Habitat’s goal is to help families get back into their homes. Repayment amount of repair cost is calculated by affordability, based on applicant’s income, debt and monthly expenses. 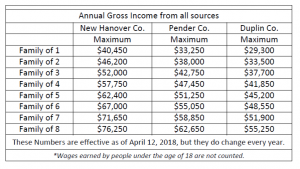 See below for MAXIMUM income amounts. To view the criteria and print an application, click here. To view what to expect after submitting an application, click here. Cape Fear Habitat builds new homes and rehabs existing homes in New Hanover and Pender counties. Habitat works in partnership with family partners, volunteers and the community at large to achieve its mission. Through this collaboration, Cape Fear Habitat plans to build 12 new homes and rehab at least 2 homes in the 2015-2016 fiscal year — all to increase housing opportunities for hard-working families. The average Cape Fear Habitat home measures about 1,100 square feet, has 3 bedrooms, 1 1/2 bathrooms, and a covered front porch. Lots vary in size from 3,000 to 5,000 square feet. Homes are built using energy-efficient construction and examined by a licensed home inspector. An estimated 85% of Habitat’s home building is completed by volunteers, including the future homeowners! In addition to other criteria, future homeowners volunteer between 250 and 400 hours of “sweat equity” before they purchase their Habitat home. Cape Fear Habitat’s Deconstruction Program enables homeowners and businesses to offset the costs of their remodeling or scraping project. Habitat’s Deconstruction services helps to identify items suitable for reuse and then carefully removes the donation items from residences and businesses. Services include kitchen cabinet removal, salvaging select materials from homes or businesses slated for demolition or remodel, and full house deconstruction jobs. Salvaged items are taken to the ReStores and sold at a discount to the public, which helps reduce the cost of home-improvement in our area while simultaneously funding Habitat’s mission of building affordable homes for hard-working families. Each year, Cape Fear Habitat engages the local faith community through an Ecumenical Build. Area congregations come together in fellowship to build an affordable home for a local family, raising the funds and recruiting the volunteers to build the home over the course of four months. Churches enjoy fellowship with their own members and also work alongside other churches to create a true community spirit. In addition, Cape Fear Habitat hosts an Interfaith Build one Saturday in October each year. The build day is in observance of World Habitat Day, which is a day of grassroots action to advocate for universal decent housing. The Interfaith Build brings people of different faiths together to work and pray together, and to shed light on the need for affordable, safe, and sustainable housing for everyone. Collegiate Challenge is a Habitat for Humanity International initiative that offers an alternative break program for college students across the country. Cape Fear Habitat hosts more than 60 students over three weeks each spring. These students arrive in Wilmington ready and willing to build a home and help a family. By the end of the third week, the home is near completion and the family is only a few weeks from being able to purchase and move into their home. Builders Blitz began in 2002 when Raleigh custom home builder Tom Gipson recruited 12 builders to construct one house each in just a five-day period; and it was a success! In 2006, the Home Builders Blitz became a national model. To date, more than 1,500 homes have been built across the United States during the Builders Blitz. 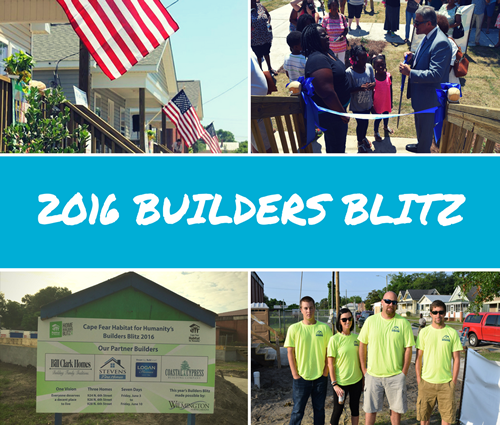 Cape Fear Habitat held its very own Home Builders Blitz in 2016, which included a start to finish build of 3 homes with the help of several local builders and the City of Wilmington. Our partner builders consisted of Bill Clark Homes, Stevens Fine Homes, Logan Homes and Coastal Cypress Building Company. At Cape Fear Habitat, we know that affordable housing is essential, but we also know that a great community is about much more than houses. The Neighborhood Revitalization Initiative (NRI) is an effort to transform neighborhoods using a holistic approach – joining residents, nonprofits, businesses, local governments, and communities of faith to create and implement a shared vision of revitalization.